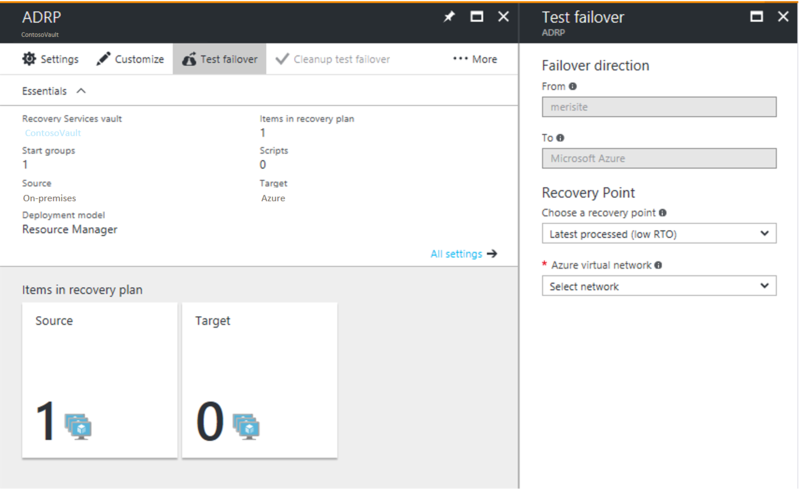 This article describes how to run a disaster recovery drill to Azure, using a Site Recovery test failover. You run a test failover to validate your replication and disaster recovery strategy, without any data loss or downtime. A test failover doesn't impact ongoing replication, or your production environment. You can run a test failover on a specific virtual machine (VM), or on a recovery plan containing multiple VMs. In Site Recovery in the Azure portal, click Recovery Plans > recoveryplan_name > Test Failover. Latest processed: This option fails over all VMs in the plan to the latest recovery point processed by Site Recovery. To see the latest recovery point for a specific VM, check Latest Recovery Points in the VM settings. This option provides a low RTO (Recovery Time Objective), because no time is spent processing unprocessed data. Latest app-consistent: This option fails over all the VMs in the plan to the latest application-consistent recovery point processed by Site Recovery. To see the latest recovery point for a specific VM, check Latest Recovery Points in the VM settings. Latest: This option first processes all the data that has been sent to Site Recovery service, to create a recovery point for each VM before failing over to it. This option provides the lowest RPO (Recovery Point Objective), because the VM created after failover will have all the data replicated to Site Recovery when the failover was triggered. Latest multi-VM processed: This option is available for recovery plans with one or more VMs that have multi-VM consistency enabled. VMs with the setting enabled fail over to the latest common multi-VM consistent recovery point. Other VMs fail over to the latest processed recovery point. Latest multi-VM app-consistent: This option is available for recovery plans with one or more VMs that have multi-VM consistency enabled. VMs that are part of a replication group fail over to the latest common multi-VM application-consistent recovery point. Other VMs fail over to their latest application-consistent recovery point. Custom: Use this option to fail over a specific VM to a particular recovery point. Select an Azure virtual network in which test VMs will be created. Site Recovery attempts to create test VMs in a subnet with the same name and same IP address as that provided in the Compute and Network settings of the VM. If a subnet with the same name isn't available in the Azure virtual network used for test failover, then the test VM is created in the first subnet alphabetically. If same IP address isn't available in the subnet, then the VM receives another available IP address in the subnet. Learn more. If you're failing over to Azure and data encryption is enabled, in Encryption Key, select the certificate that was issued when you enabled encryption during Provider installation. You can ignore this step if encryption isn't enabled. Track failover progress on the Jobs tab. You should be able to see the test replica machine in the Azure portal. To initiate an RDP connection to the Azure VM, you need to add a public IP address on the network interface of the failed over VM. When everything is working as expected, click Cleanup test failover. This deletes the VMs that were created during test failover. In Notes, record and save any observations associated with the test failover. Prerequisites: A prerequisites check runs to make sure that all conditions required for failover are met. Failover: The failover processes and prepared the data, so that an Azure VM can be created from it. Latest: If you have chosen the latest recovery point, a recovery point is created from the data that's been sent to the service. Start: This step creates an Azure virtual machine using the data processed in the previous step. VMware VM that don't have DHCP enabled , irrespective of whether they are using DHCP or static IP addresses. In all the other cases, no intermediate step is not required, and failover takes significantly less time. The test network should have same number of subnets as your production network. Subnets should have the same names. The test network should use the same IP address range. Update the DNS of the test network with the IP address specified for the DNS VM in Compute and Network settings. Read test failover considerations for Active Directory for more details. Make sure that the primary VM is shut down when you run the test failover. Otherwise there will be two VMs with the same identity, running in the same network at the same time. This can lead to unexpected consequences. Any changes to VMs created for test failover are lost when you clean up the failover. These changes are not replicated back to the primary VM. Testing in your production environment leads to a downtime of your production application. Users shouldn't use apps running on VMs when the test failover is in progress. To run a test failover for application testing, you need a copy of your production Active Directory environment in your test environment. Read test failover considerations for Active Directory to learn more. If you want to connect to Azure VMs using RDP/SSH after failover, follow the requirements summarized in the table. Azure VM running Windows On-premises machine before failover To access the Azure VM over the internet, enable RDP, and make sure that TCP and UDP rules are added for Public, and that RDP is allowed for all profiles in Windows Firewall > Allowed Apps. To access the Azure VM over a site-to-site connection, enable RDP on the machine, and ensure that RDP is allowed in the Windows Firewall -> Allowed apps and features, for Domain and Private networks. Make sure the operating system SAN policy is set to OnlineAll. Learn more. Make sure there are no Windows updates pending on the VM when you trigger a failover. Windows update might start when you fail over, and you won't be able to log onto the VM until the update completes. Azure VM running Windows Azure VM after failover Add a public IP address for the VM. The network security group rules on the failed over VM (and the Azure subnet to which it is connected) need to allow incoming connections to the RDP port. Check Boot diagnostics to verify a screenshot of the VM. If you can't connect, check that the VM is running, and review these troubleshooting tips. Azure VM running Linux On-premises machine before failover Ensure that the Secure Shell service on the VM is set to start automatically on system boot. Check that firewall rules allow an SSH connection to it. Azure VM running Linux Azure VM after failover The network security group rules on the failed over VM (and the Azure subnet to which it is connected) need to allow incoming connections to the SSH port. Add a public IP address for the VM. Check Boot diagnostics for a screenshot of the VM. Follow the steps described here to troubleshoot any connectivity issues post failover. After you've completed a disaster recovery drill, learn more about other types of failover.